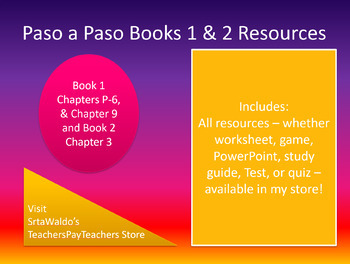 This includes all the files in my store related to Paso a Paso Books 1 & 2. I did not teach all chapters, so this includes my worksheets for Book 1 Chapters P-6, and Chapter 9 and Book 2 Chapter 3. The study guides and test banks found elsewhere in my store are in this resource, too.